The College Central Library providing service to students and Faculty has been automated infrastructural facilities. With the State-of-the art equipments, we have a huge collection of information, which are available in digital format including audio/video, online courses apart from books and periodicals. Our vision is to provide world class knowledge resource that not only caters to the curricular requirements but also promotes intellectual enquiry and research. We propose to achieve this through superior quality service consistently Future oriented and customer driven process, which is constantly updated to meet our customer requirements, and focuses on values like quality, utility accessibility and stability. The Library is an integral part of the intellectual power of our college. Its Mission is to provide collections and services that support the educational goals of the college. At present the library houses a collection of 58,984 Books printed volumes subscribes to more than 222 periodicals and more than 4493 Non-book resources. Utmost care is taken in developing resources for each department. The central library areas are 1004.50 sq.mt. The Uniqueness of our library the expansive study space blended with state-of-art facilities. The Digital Library service unit provides access to computers with internet facility. It provides many computers in the Digital Library. The Library has high density of shelving for printed collections, the digital library collection, audio-visual materials facilities etc. The library also has vast collections of CD-ROM publications, e-book CDs, Floppy Disks, audio cassettes, and technical reports, etc. We subscribe E-Journals the cost of Rs.17.40 Lakhs, which covers IEL(IEEE) online Journals 161 numbers, ASME online product 27 numbers, Science Direct 275 numbers, Springer online journals 149 numbers, ASCE online journals 35 numbers, J-Gate online products 1700 numbers, ASTM online products 1700 e. resources, and Mcgrawhill online engineering library its contain the e.books and e.resources also Digital Library Management Solution at the cost of Rs.95,000 cover 300 e-books. The library is open to staff and students from 8.00a.m. to 7.00p.m. on all working days for information retrieval and services. Document delivery and Reprographic facilities are the additional services offered by the Library. The library is fully (LIBASOFT) computerized which enables the users to search the availability of resources from any computer in the campus connected to the network. The system uses standard barcodes to identify resources and users for day to day transactions. 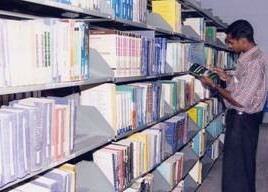 The College has a mobile library in which Newspapers, Magazines, Short story books are displayed in a College van. The students’ volunteers and library staff go to the villages in this mobile library and promote reading habits among the villagers.